A young woman in a padded cell wearing headphones and a straitjacket. Wings protrude out the back of the straitjacket. 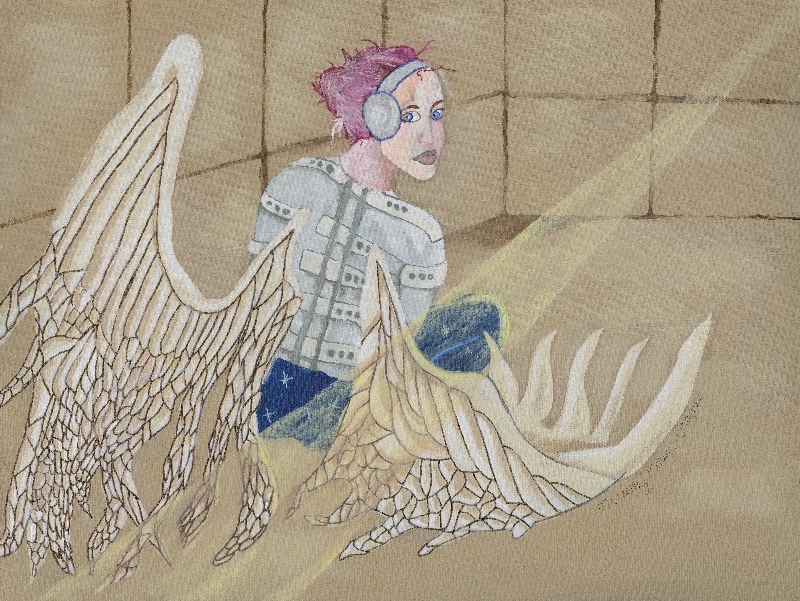 The wings represent how the ADA has liberated people with disabilities. The ray of light stands for hope for the future. I chose a padded room because so many people with disabilities are isolated. Listening to music through headphones can be therapeutic. I have enjoyed creating art since childhood, my first endeavors into the world of art were with a pencil and sketchbook, I was drawing all of the time filling sketchbook after sketchbook with mythical flights of fancy, celebrity portraits and portraits of my friends and family. I primarily utilized my pencil, but would dabble from time to time with chalks and colors. It wasn’t until my later years that I delved into the use of acrylic paints. Over time my art took on a surrealistic approach with a philosophical view. I enjoy pushing myself with my art and how I portray my visions, even utilizing colors I wouldn’t normally have a tendency to use. I will often take a step back from my work for long periods of time to examine each painting closely before continuing on with it. I joined the Air Force in 2001, initially I was stationed in Texas and later overseas in Germany. While I was in Germany I spent as much time as I could travelling, enjoying the culture and art that I found there, I was even able to visit the Louvre in Paris and was completely enthralled with the Mona Lisa. When I was twenty-five years old and deployed in Germany for active military service I was diagnosed with Paranoid Schizophrenia, which altered my life forever. I was placed on a medical hold and spent several months at Walter Reid Hospital. I use my disconnection with reality as a way to push past boundaries and limitations that real life can impose and put those thoughts, ideas and images on canvas. I struggle with communicating with people, I find it difficult and often feel uncomfortable, I find that painting allows me to speak to people on another level, conveying thoughts, ideas, feelings and emotions that I find it difficult to convey otherwise. I make connections in my mind that others don’t see or hear and will include them in my work. Most of my inspiration comes from music, I listen to music every day, for long periods of time. Today I spend the majority of my days listening to music, riding my bike, visiting parks, playing with my cats, painting or drawing and visiting as many Art Galleries as I can to get lost in myself for hours viewing all of the beautiful art to be found there.